Amy is a 36 year old mother of 6. On April 15th, 2010, she was diagnosed with a rare and terminal cancer: Adenoid Cystic Carcinoma. Surrounded by her family and friends, she is determined to face her future with faith, hope, courage and love. Surrounded by her family, and with Gary by her side, Amy passed away in the early morning hours of July 3rd, 2010. Just a short 2 1/2 months after being diagnosed with cancer. And still I sit her and I wonder what he has in store for me and my family. I wonder why it is that my beautiful wife's time on this earth is almost up. I wonder for what purpose he is taking her from our family at this time in our lives. I wonder how will I continue on without her and what effect this will have on my children's lives. Even with all the knowledge and peace and comfort I have received, there are still so many questions. All I can do is try my best to have faith that He knows the end from the beginning and that Amy's talents and abilities are needed more on the other side of the veil than they are here. I also sit and think of all the wonderful things my wife has done and the amazing legacy she will leave with us. She has attained as much perfection in so many areas of her life as anyone I can imagine and I suppose that she has proven herself a valiant servant and no longer needs to be tried and tested on this earth. I sit and I think of all the little things that I will miss so much about my wife. I will miss the way we tease each other. I will miss the way she always plans memorable events on holidays and other occasions to help us create so many memories and traditions. I will miss her laugh, her smile and her sense of humor. I will miss the way she lays her head on my chest while we talk in bed. I will miss the way she always says "we need to talk" (even though sometimes I've learned to dread that phrase). and yes I will even miss the way she rolls in bed and wraps the covers around her leaving me to have to snuggle close to stay warm. And then there are all the simple little things that you never realized how much you appreciated, who will pick at the pimples on my back when it breaks out( I know, T.M.I. ), or who will scratch my back when I cant reach it or who will remind me (sometimes I called this nagging) of all the things that I need to do. There are so many things that I will miss about my wife that it is impossible to list even a small portion of them. There are so many things about Amy that I have always taken for granted. I just always figured that she would be there. Now I will have to adjust my life to living without having all those things that I really never knew meant so much to me and that is what is going to be the hardest. Over the past couple of months I have thought long and hard about how much my wife means to me and I have been so grateful for my marriage and the ways in which we have grown together over the years. We have truly been blessed with a great love for each other and we have done a lot to strengthen our relationship over the years though it hasn't always been easy. We have worked hard to overcome differences and difficulties. And as I sit here, I can't help but hope that all of you who read this can have as much happiness and love in your marriage as we have. (Now don't get me wrong it hasn't been total bliss all of the time.) But we have had a strong marriage with all that we have learned and experienced. I know that there are not nearly as many men who will read this as there are women, but to those who do, I would like to share a little advice with you that might help you to strengthen your marriage... Always take your wife into your arms each and every morning and each and every night and tell her how much she means to you. Don't assume that she knows you love her... tell her... Show her by doing little things to surprise her. Bring home her favorite candy bar when you come home from work just so she knows you were thinking about her. Call her out of the blue during the day and tell her you love her. Tell her something about her that you appreciate each day. think of all the little things you love about her and share them with her. Share a new reason each day. Don't ever think of things that you wish she would improve on, or how you wish she were different in some ways. Always find ways to make her feel like she is your queen. Think of all the things you would miss about her if she were taken from you suddenly, and be grateful for them and show her your gratitude. Don't try to change her, treat her like she is your everything and either change will come because she will want to show you her appreciation in return or more likely you will learn to look past her faults and understand that she is only human and almost as imperfect as you... I know that I directed this to the husbands because I am one, and I suppose I speak from experience as a husband, but I guess that this advice could be just as good for all of you women as well. Now I know that I am far from a perfect husband and I don't presume to be an expert on relationships but as I have reflected on my own marriage and what has worked and what has not, I have found that our greatest happiness in our marriage came not when my wife was doing all the things that I wanted her to, but when I was doing all the things that I felt she wanted me to. Some how it seems that those efforts were always met with an eventual equal effort on her part to do the same. When we are more concerned about the wants and needs of our spouse than we are with our own wants and needs, we become less self centered and really contribute to the success of our marriages. I am not even sure why I went into all this other than I hope that as a result of the things that I am going through someone else might be strengthened or helped in some way by it. Again, I know I am no marriage counselor, but I have had a lot of time to think about what I will miss about my wife and about all the things I love about my wife. I have tried to be a good husband and I hope that I have shown her the love that she deserves. I don't want to have any regrets. and I hope that each of you will not take for granted the person who should mean the most to you. I hope each of you who read this get as much from it as I got from writing it. It is such a strength to me to sit down and write the feelings and thoughts that I have. It is a good way for me to sort out my thoughts and feelings. It is a great way for me to reflect on all of my blessings and to recognize all that my Heavenly Father has done for me. I am so grateful to all of our wonderful friends and family who have strengthened me with your words of encouragement and support. I do know that our Heavenly Father loves us and knows what is best for us. He knows our needs and he is aware of our trials and stands ready to give us the comfort we need. The power of prayer is amazing. When we truly come to Him with real intent, he will listen and he will give us what we need to bear our burdens. Thank you all for taking the time to read my ramblings. I know that sometimes I jump from subject to subject but I am just writing the things that are in my heart. May you all reflect on your own relationships with your husbands or wives and determine to spend your life showing them how and why you appreciate them. May you all find love and joy in your marriages and if you are not married, then may you always remember the things that I have learned and put them to good use when you do get married. May the Lord bless each of you and keep you. It is getting late and I must say goodnight to the beautiful, full moon. Till next time. Love you guys!!! Praying for you all, as always. I think your advice is perfect for all of us. Thank you so much for sharing what you are feeling. I think of your family everyday and hope and pray that you will all be ok. Thank you so much for sharing your feelings with us I am starting to think you have got to be the strongest man I know, I am sure that is just because you are sharing it and others don't. You and Amy are both amazing. Your words were what I needed to hear. I have a quote on my wall that reads, "Love is a condition in which the happiness of another person is essential to your own." I agree with you. You find the most happiness when making your loved ones' happy. You have been that person to Amy. She loves and admires you. She tells her friends on many occasions. I know that I give you a hard time-but know this. I am so grateful to be able to see you in this capacity. You have been so devoted to Amy and she feels more at ease when you are there. You are her safe place! Thanks for sharing your thoughts! I, too, am a complete stranger. I came across your blog from a friend who posted it on her page. I'm currently separated from my husband and we've been contemplating divorce, which is hard for the both of us. I'll be forwarding your beautiful words to him. A lot what you miss, is what I am missing. I feel how you feel, although our story may be in a different, it's the same. I can only hope for Amy to feel at peace. I can feel the love you have for your amazing wife in your words. I truly can't thank you enough for sharing. My father passed away from glioblastoma multiform. I know the struggle of cancer. I pray for your family and Amy. You will for always remain in my thoughts, my heart and prayers. I'm also a complete stranger. One day I was driving through Santaquin and saw a huge yard sale and said to my mom drving in the car with me, "WOW that is a big yard sale"! Then she proceed to tell me about your story. It completey broke my heart. Then my cousin told me about your blogspot and I got on to read it. She told me to read this post so I did. Well Let me say I started balling within about 2 minutes. Me and my husband has been having a hard time lately and well.... this is exactly what I needed to hear! Thank you so much for being so brave to post your life for all to read. THANK YOU from the bottom of my heart!! You and your family will always be in my heart, thoughts and prayers! I opened this blogspot from the obituary of your sweet wife. I lost my best friend and husband to Leukemia just over 3 years ago. Everything you say is so true. Thank you for sharing your feelings so openly to strengthen and help others who may be struggling in a relationship. It is truly one of the hardest things we go through in this earthlife experience. You are such a strong man and Amy was very fortunate to have you as her companion. Your words have really got me thinking. May our Heavenly Father help you through this very hard time. Thank you for your heartfelt advice. I will try everyday to follow it out of support and respect for your family. You have helped me and I am sure many others. Give your kids a big hug and get support from family and friends.God bless you. You have a beautiful way with words. Know that your story, and your amazing wife have touched my heart. Your family is in my thoughts and prayers. I feel blessed to have found your post today. I plan to share it with many people. The love of my life lost his wife to cancer last year. When I read your words I was reminded of him and all the things he learned during his wife's illness and passing. I don't know you, but my prayers go out to you and your family. Your words are lovely and filled with love. Our family lost our oldest son to Neuroblastoma 5 years ago and we know the pain too and I hope God blesses you with His love and comfort at this hard time. Your love for your wife is obviously very deep and I pray that you will be able to always feel her love back and find happiness in your new life without her here. May God bless you and your family always. Oh Gary. Such beautiful thoughts. Hang in there! I have been touched by your story. Please know that prayers have been sent up for you and that "those who live in the Lord never see each other for the last time." God bless you and your beautiful children. wow. thank you gary. this was a beautiful post and I learned so much from reading your thoughts. My heart aches for your family but I am praying for the Lord's strength to be with ALL of you! My husband is in the Army and was gone for five months, although it is no where near the same as losing your spouse, I feel like I can very much relate to what you're saying. Its true when they say to not sweat the little things, they just don't matter. I love what you wrote and agree whole heartedly! I am truly very sorry for your loss, I hope you know that you have a lot of support, even from total strangers. I know I'll be praying for you as well! I wish your family all the comfort our loving Heavenly Father can give! What a beautiful post. I'm sorry for the loss of your wife. She'll be waiting for you in your perfectly decorated mansion above. I will pray for you and your children. 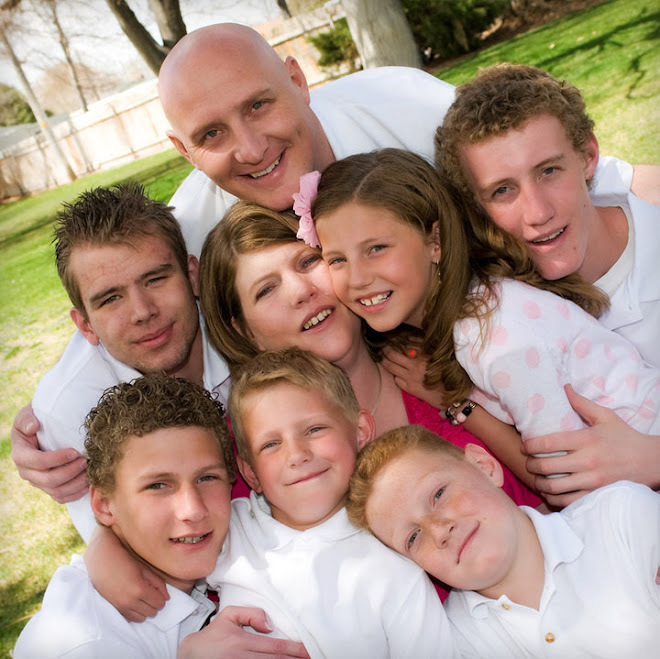 I know that Heavenly Father will guide you in your new roll as mom and dad- You can do it. You're not alone. What good reminders. What a legacy. Thank you for sharing. Your story brought a flood of memories as my mom also passed away from cancer when she was a young 37 years old--also leaving behind six kids. I KNOW from my own experiences that Amy will still be able to be with you in the big and small life events and when you need her the most. I KNOW that Heavenly Father will provide a way for things that may seem hard now. An idea for you (if it hasn't been done already)--a few of my mom's close friends had everyone who knew her write down their favorite memories, recipes of hers, photos, etc and compiled them in a book for each of the kids. It is one of my greatest treasures! Praying for peace and comfort for each member of your special family. thank you that was beautiful. best wishes for you and your children. Thank you so much for those words Gary, my heart is with you and your family. This is my first time to read your blog and what you have written in this post has literally stopped me in my tracks. I am married and I love my husband and I am sure he knows I do. Having read your words I pulled out my phone and sent him a text message that he will get in work. I told him how much I love him and why. It may not change the world but if it makes him smile then it will be the ripple that will hopefully lead to a kiss as he gets in the door and as the kids bowl him over and tell him all their news and they consume him until their bedtime hopefully he will hold in his heart the good things I have told him today and we will make more of our time together when the kids are tucked up in bed. I hope what I am saying is not rubbing salt in your wounds. I feel so mean talking about my family when yours is going through so much grief. I just want to let you know that your words written under and American moon have touched a mum sitting in the Australian sunlight. We do not know each other, but I wanted to thank you for your heart-felt words. I can only pray that I remember and follow this advice when I get married some day. I am so sorry for the passing of your wife. Continued thoughts and prayers for comfort to your sweet family. my prayers are with you and your family. this is my first time here...and i am so very touched. tomorrow is my 16th wedding anniversary to my husband, and i am so glad that i read your heartfelt words. thank you! This is so tender, I'm fighting back tears at work. Thank you for this beautifully written post. It's so touching to read about such true love felt between you two. I'm a newlywed, and already want to strive to be better for my husband & serve & love & appreciate him in any & every way I can. Thank you for your inspiring words. I'm so sorry for the heartache you have to go through. I'll keep you & your family in my prayers. Such a beautiful post, brought me to tears. I really truly pray that God blesses you and your family. My heart aches for the loss you all must be feeling now, but I know that God loves you and is with you all. Hoping that you and your children will find peace in knowing that you'll see your sweet wife again one day. My prayers are for your whole family tonight. Thanks for sharing your deepest feelings. Gary, My heart goes out to you. I am sure there is nothing that could even nearly fill the void of Amy's wonderful influence in this world. Thank you so much for your words. I constantly struggle to be the husband my wife deserves, and your words have given me some ideas. I wish folks could have your perspective at lower costs! Again, thank you so much for sharing your feelings. I feel a greater sense of appreciation for my wife, and am committed to be a better husband and friend to her. This is a beautiful testimony of your marriage. Thank you. I do not know you in person but I must thank you for this. My mom (66 years old) is suffering from adenoid cystic carcinoma and my dad is caring for her. It has been a difficult time for me and my family as well. Your words are inspirational and truly comforting to all of us who are still on this journey. Thanks for commenting! Amy is truly uplifted by all the words of love and encouragement you share. I have had a few requests to start a blog for Amy, to help share her story and to also facilitate information about fundraising and other events. 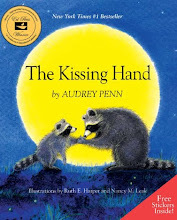 Amy has been sharing the book "The Kissing Hand" by Audrey Penn with family and friends as a way to express her love and faith. That's how the name for the blog was chosen.